We know that it's past January 1, but it is never too late to start a reading-through-the-Bible plan. The following is a collection of a variety of different plans and a bit about how they work. There are many different versions available to suit many different types of readers. This is a basic read-through-the-Bible plan, with daily readings in the Old Testament, New Testament, Psalms, and Proverbs. You can download a pdf of the plan and print it out or you can check the website for weekly or monthly updates. This site also provides a nifty starting date calculator which will allow you to reset the Bible reading plan to whatever day you wish to start on, such as January 7! You can also adjust the Bible translation and language. This plan comes from the same site, but the readings are arranged chronologically. So you start at Genesis and I Chronicles and read straight through the Bible from there. Like the previous plan, there is a starting date calculator and you have the ability to adjust the Bible translation and language. There is a printable pdf or you can check the website for weekly or monthly updates. This unique plan is structured so that each day of the week you read a different section of the Bible. On Sundays you read the Epistles, on Mondays you read the Law, on Tuesdays you read the history books, on Wednesdays you read the Psalms, on Thursdays the poetry books, on Fridays the prophecy books, and on Saturdays the Gospels. There is a printable pdf as well as a monthly and yearly calendar. There are six different Bible translations available here. This Bible reading plan takes you through just the New Testament in a year, with a single chapter of reading per day and two days of reflection (no reading) each week. The 5x5x5 stands for "5 minutes a day, 5 days a week, and 5 ways to dig deeper. This plan takes you through just two books of the Bible at a time. The first book alternates between Old Testament books and New Testament books and the second book takes you through the wisdom literature (Psalms, Proverbs, Song of Songs, Ecclesiastes) and Isaiah. The books are not in chronological order. There are only 25 readings per month, which allows anywhere between 3 and 6 days of reflections or catch-up each month. This plan is similar to the one above, but it takes you through four books of the Bible each day and it is in chronological order. Two of the books each day are from the New Testament and two of the books are from the Old Testament. The plan starts in Matthew, Acts, Psalms, and Genesis and simply takes you from those four books through the rest of the Bible chronologically. There are only 25 readings per month, which allows for extra time to reflect and catch-up. A printable pdf is available for download. It is also available in Spanish. 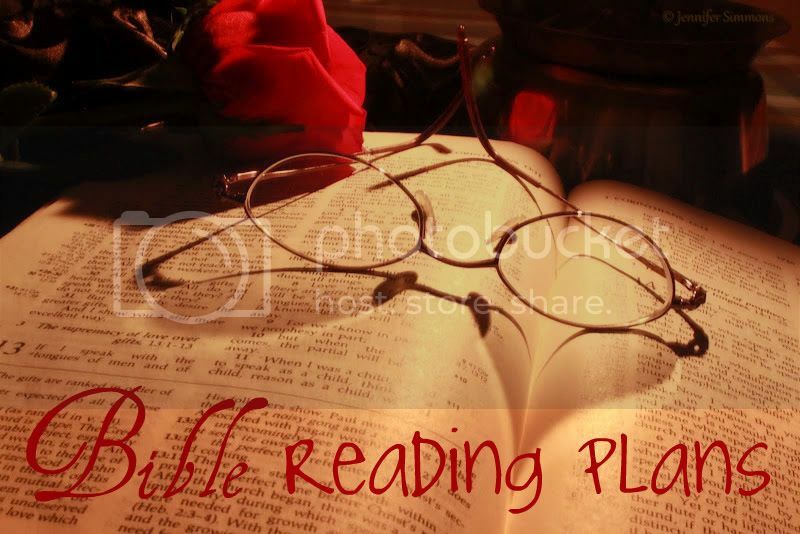 The English Standard Bible has several reading plans available on their website that are available in a variety of different formats: web, RSS, e-mail, iCal, mobile, and print. While each plan is specifically for the ESV Bible, using the printed format will allow you to choose whatever translation you wish. Of particular note is the Book of Common Prayer Daily Office Plan, which follows the official readings from the Book of Common Prayer and are structured around the different seasons of the church year (advent, epiphany, and so forth). We hope this collection of plans is helpful to you in your own study and reading of the Bible! And we'd be interested to know what you do: Do you use one of these plans? Another plan? Or do you not use a plan at all? What works best for you? Thanks for all the great ideas. I have been reading the Bible through three chapters a day and five on Sunday. I was looking for a new plan and I am thankful that some of them can be started later (considering I started in the middle of the month last year) Thanks! Thank you for the information! I have a one-year Bible that I enjoy reading. Last year I read the Old Testament, Psalms and Proverbs daily portions. This year I am reading the New Teastament, Proverbs and Psalms. I like to keep a journal and daily write down a verse or a thought from the reading or what God has beeen teaching me. I like to add my personal commentary which can help me, when looking back, to remember why the verse stood out to me. Sometimes I write down a verse that doesn't make sense to me and pray that God would help me understand it. Recording these things in my journal helps me to be more faithful with my quiet times because I feel guilty when my journal is missing a date (or a few). Thanks again for the post!